Choose a different kind of pickup truck by going with the Honda Ridgeline. You get practical features that address everyday needs, so you have a vehicle that pairs well with your activities. This truck also provides amazing comfort, making it something everyone will appreciate. For a great deal on a 2018 Honda Ridgeline for sale in Sacramento, check out the extensive stock at Mel Rapton Honda. All Honda Ridgeline models come with excellent performance chops. That means you can tackle any job, climb hills, and do whatever else necessary without problems. At the heart of this truck lies a 3.5-liter V-6 direct-injected engine. It puts on tap 280 horsepower for quick acceleration when you need it. The peak 262 lb.-ft. of torque helps you to tow as much as 5,000 pounds with all-wheel drive, or 3,500 pounds with two-wheel drive. Variable cylinder management, i-VTEC, and an Eco-Assist System help with conserving gas, without sacrificing performance in the process. To help with towing and hauling, the standard radiator has a large capacity, plus two high-power fans. A 6-speed automatic transmission mates to the engine. It helps with quick gear changes, and makes handling bigger loads possible. Performance goes beyond just power, because the Honda Ridgeline offers a practical approach. Standard hill start assist means the truck won’t roll backwards when you start off from a standstill on a steep incline. Intelligent Traction Management helps you maintain control on slippery surfaces like snow or sand. 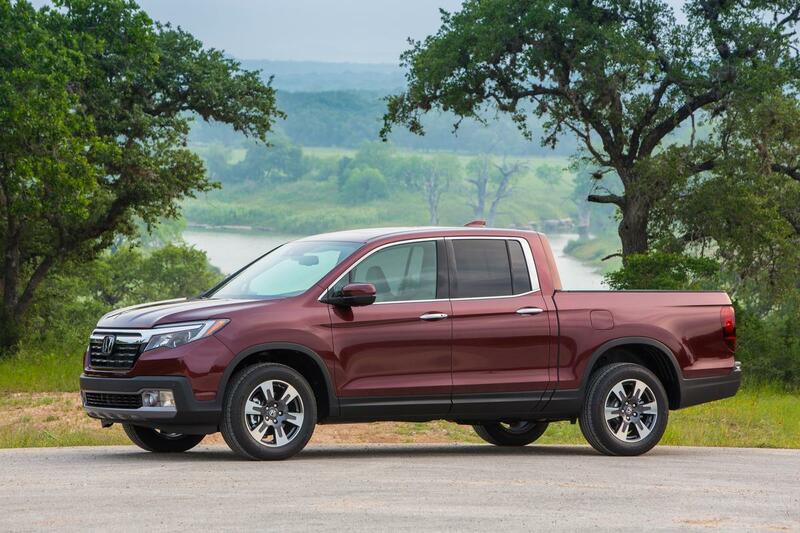 Thanks to the unibody construction, MacPherson strut front suspension, and multi-link rear suspension, the Honda Ridgeline drives more like a car. That means greater comfort, and more predictable handling on rough surfaces. One of the main reasons to buy a truck is for the exterior features. The Honda Ridgeline makes towing and hauling simple, plus adds other conveniences. For example, the truck bed has a trunk in the bottom. The compartment locks, making it great for stowing valuable items you don’t want to chance leaving in the cab. The tailgate can flip down like on other trucks. It can also swing front either end, like a car door, when you don’t want to reach over it to get items out of the bed. Watch a TV at your tailgate party, run a circular saw, or do any number of other activities with the three-prong electrical outlet in the Honda Ridgeline bed. It’s covered to protect against weather and debris, and provides tremendous convenience. You spend a lot of time in your vehicle, so having a comfortable interior loaded with conveniences is helpful. You get all that with the Honda Ridgeline. Push button start means you keep the keys in your pocket. The center console can accommodate a 10-inch tablet, along with many other items. Even the rear seat bottom cushions flip up, allowing you to haul taller items in the cab. As the driver, you’ll appreciate the 4.2-inch color multi-information display in the gauge cluster. Use it to quickly track everything from fuel economy numbers to trip odometer and outside temperature. Learn about the many other features on the 2018 Honda Ridgeline by coming to Mel Rapton Honda.